I'll begin with a mystery. On a hike in the Kukutali Preserve, I couldn't help but notice all the daisies blooming along the road. A dark object on one of them caught my eye. Looking closer, I knew I should get a photo of it. I figured out it was a Harvestman, but I don't know what kind. Another name for them is "Daddy Longlegs," but this is like no Daddy Longlegs I have ever seen. Wikipedia says, "typical body length does not exceed 7 millimeters (0.28 in)." This one was at least twice that size. I do get the delicate little Daddy Longlegs in my house. They seem to like my shower. My house guests, however, have tiny bodies that are under a quarter inch long. Perhaps Kiket Island grows them extra large and robust. I would enjoy hearing from anyone who can provide more information about this big guy. 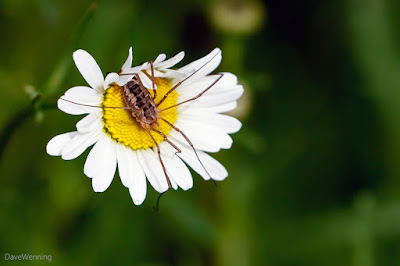 Harvestmen are arachnids like spiders and scorpions, but of a different order, Opiliones. They have eight legs like other arachnids, but unlike spiders, they have only one pair of eyes. This one had a firm grip on the flower which was bobbing in the wind at the time. I suspect it was lying in wait for prey, perhaps aphids which are a favorite food. The Harvestman got me curious to see what else I could find lurking among the daisies. My next discovery was this beautiful Hoverfly. It was obviously designed to look like a Yellow Jacket, possibly to fend off predators. 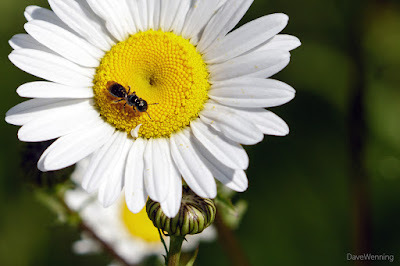 According to the Pacific Horticultural Society, they are beneficial insects in the garden which should be encouraged. Their larvae feed on garden pests and the adults are excellent pollinators. Attract them by providing a long season of available pollen, including flowers, trees and grasses. 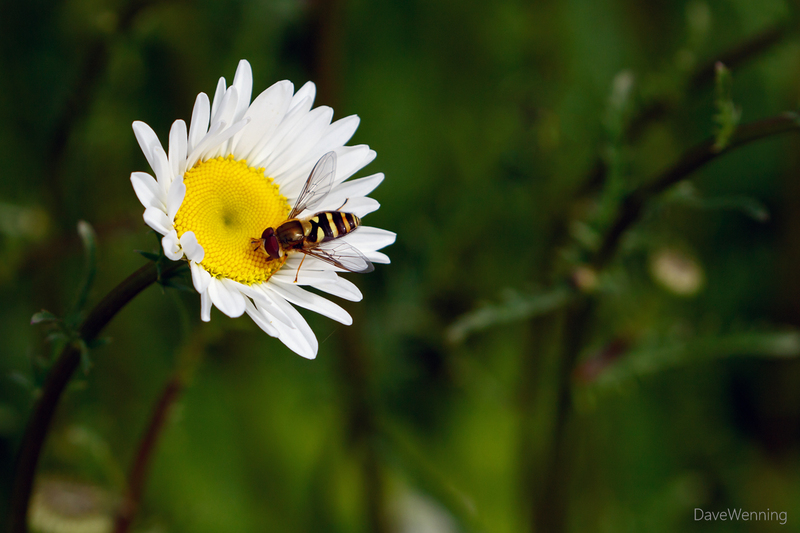 Avoid insecticides and just let the Hoverflies do the job. From the Aster family, Oxeye Daisies (Leucanthemum vulgare) are introduced wildflowers from Europe and Asia. Besides North America, it has also been introduced into Australia and New Zealand. This English-speaking pattern may provide a hint to its origins. 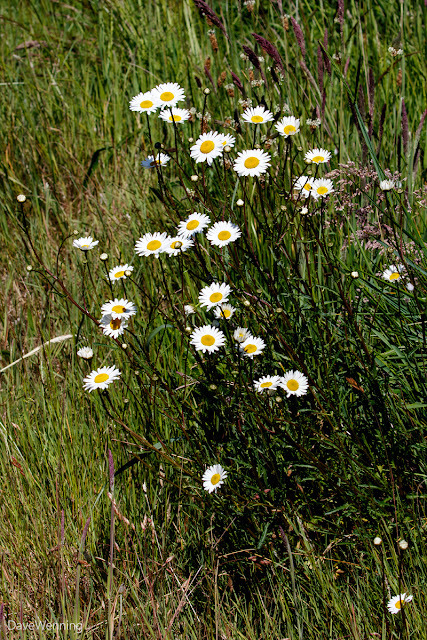 It is a grassland perennial that seems to be abundant in dry, rocky, disturbed areas around here. Look for them along road sides and in vacant lots. 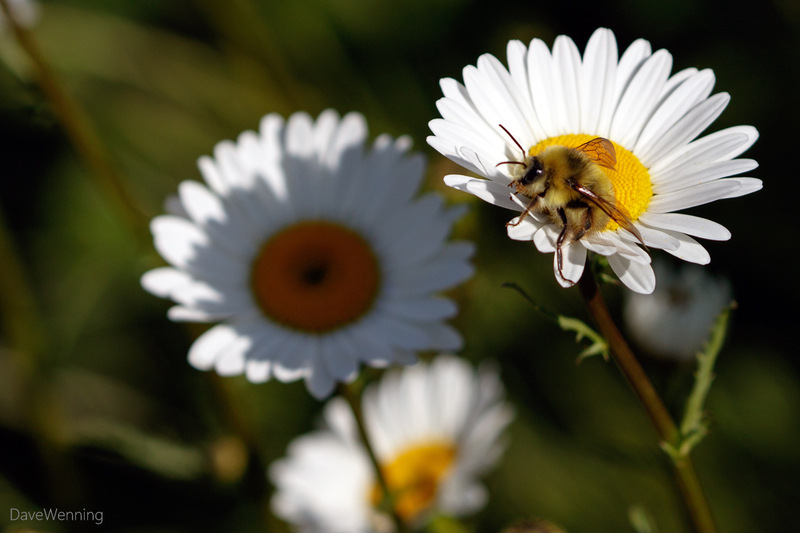 The word "daisy" comes from Old English daegesege meaning day's eye which may describe their behavior. Some varieties will open in the morning and close back up at night. Others will keep their flowers turned to the sun as it crosses the sky. Chaucer called them "eye of the day." In Medieval Latin they were called solis oculus, sun's eye. 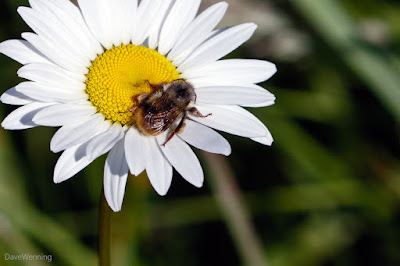 At first, I thought this appeared to be a Sweat Bee, possibly Lasioglossum. As I kept studying bee species, I came across another possibility, a Small Carpenter Bee, Ceratina. What do you think? As expected, there were lots of Bumblebees. The bit of orange on the abdomen might make this one Bombus mixtus, the Orange Tail Bumblebee. I could be wrong. I am discovering how difficult and confusing it can get trying to ID them. 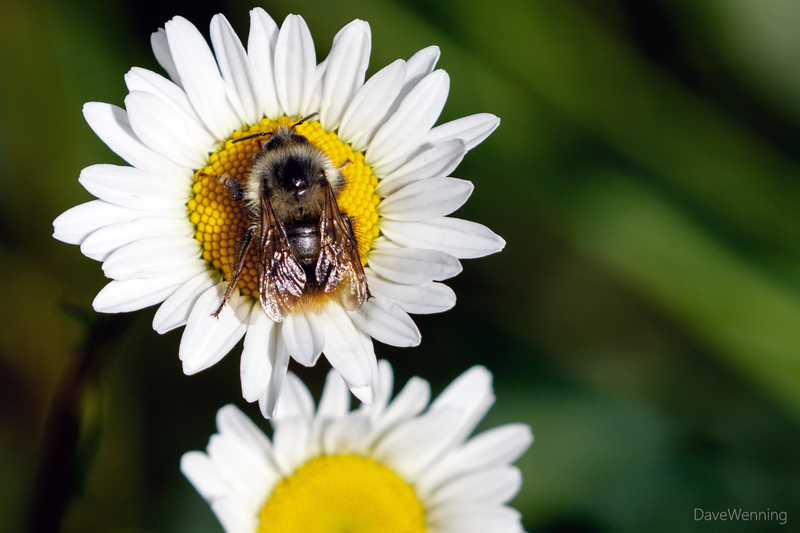 To me, this one and the next one look like Sitka Bumblebees (Bombus sitkensis). Please let me know if I am wrong. 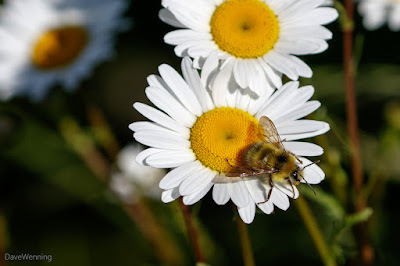 In searching the net for both Bumblebees and Carpenter Bees (below), I was amazed to discover the emphasis was on "pest control" how to get rid of them. More and more, Google seems to want to take us where the money is. Let me say, I have done a lot of gardening in close proximity with bees of all sorts. I have never found a reason to want to get rid of them. I have been stung by wasps that tend to be aggressive, but never by any kind of bee. In fact, I find they prefer to ignore me and just go about their business. Personally, I have always sought ways to encourage them to come to the garden. This one has a black, hairless abdomen, so I am calling it a Carpenter Bee. They come in two varieties, "large" like this one and "small" like the one above. Next time you go hiking, look closely at the wildflowers you encounter. The "eyes of the day" may be looking back at you. It's time for a quick math lesson. Anyone interested in nature should become familiar with the Fibonacci Sequence of numbers. The reason will become clear in a moment. Now, starting with the first 1 x 1 square, draw a continuous arc through opposite corners of each square. The result is an expanding spiral shape. As it turns our, this Fibonacci spiral can be seen in nature. It occurs throughout the natural world, including some unexpected places. 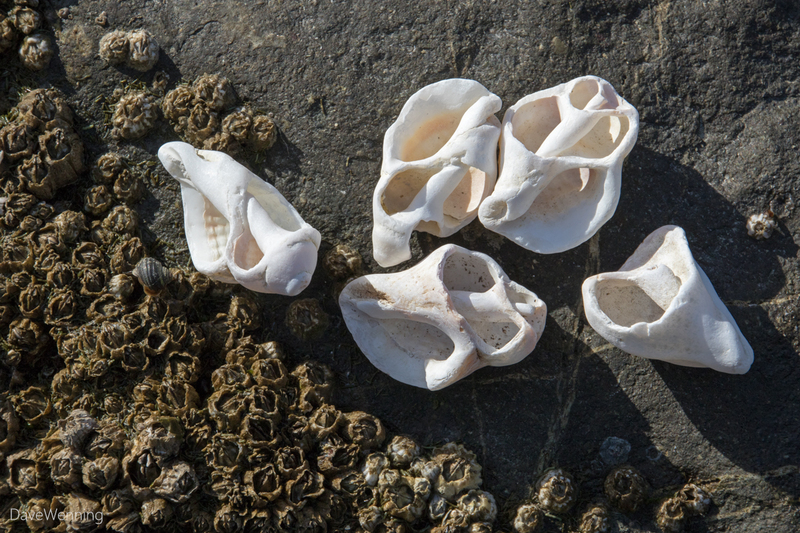 I collected the broken dogwinkle shells to the right on the beach at Kiket Island. Because they are broken, it is easy to see the geometry of the shells. The shells are built of Fibonacci spirals. Other examples include the tapered outline of a hens egg, a spiral galaxy such as our Milky Way, the arrangement of scales on a fir cone, breaking ocean waves and the shape of the fiddle heads on fern shoots. Even the orbital periods of planets in our solar system may be following a Fibonacci sequence. This might be occurring since it is the most stable and efficient pattern that can be produced naturally. One study speculates that the pattern of spirals in plants occurs straightforwardly as a response to mechanical forces in the growing plant. Now, why do I bring this up here? Click or right-click one of the closeup photos of daisies above. The yellow compound flowers in the centers are arranged in Fibonacci spirals. To bring this back to nature, consider the five-armed starfish. Five, of course, is a Fibonacci number. Begin with a pentagon with sides 1. Add diagonals to form a five pointed star inside the pentagon (left). The ratio of the sides to the diagonals will be 1:1.618. Thus, the design of a starfish employs the golden ratio based on the Fibonacci sequence. Notice the apple blossom has five petals and the apple itself, sliced horizontally, is designed with five-pointed symmetry. Goosebumps anyone? This post is appearing simultaneously at Wild Fidalgo where you can explore the wildlife on and around Fidalgo Island, Washington. I love your math/nature lesson! I have heard that before, but the details didn't stick. They probably won't this time either, but I'll remember it better. I have had a ton of bees this spring on my raspberry blossoms, ceanothus, sage blossoms, and now lavender. I've seen bumblebees and what I think are honey bees, but beyond that I'm not distinguishing. I will look more closely now!